SAMAN POS India Pvt Ltd is the top supplier of prefab structures in India and Overseas. Since 2017, we have persistently tried and prospered to established ourselves as a prominent figure in the market. Our exceptional ranges of prefab structures include mobile offices, mobile homes, prefab buildings, pre-engineered farmhouses, portable sheds, porta cabins, security office, including 30+ products. 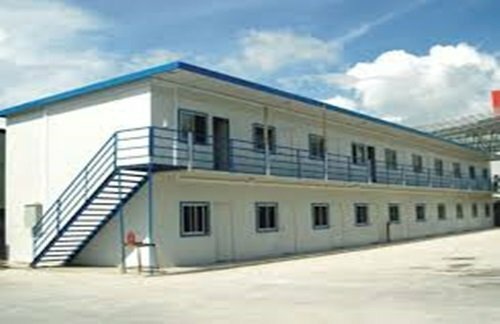 We offer tailored Prefabricated Office by taking various aspects in consideration like sizes, layouts, budget, and designs. At SAMAN POS India Pvt Ltd, we work alongside you with your every step. You express us your idea and we design you a fully functional prefab office with an elegant interior layout. Our prefab office offers you to a viable platform to move your office to different sites and develop your business with new uncharted opportunities. Whether you want an in-built kitchen, restrooms, cubicles, closets or all in one, we get everything covered for you. Unlike traditional structures, you don’t need to keep your finger crossed and hopeful for a better result. As a reliable organization, we have an active partnership with significant manufacturers who use progressive technology and skilled engineers. As a result, you get an élite product which is also aesthetically pleasing to eyes. Our prefab constructions go through a wide-ranging manufacturing phase which comprises a modern designing process from our skilled designers. All we need is a basic idea about your business and then we provide you a selection to choose a design from our fashionable collections. We also welcome new ideas in our organization. If you have a blueprint, then we ensure you to build that idea in a vibrant office. 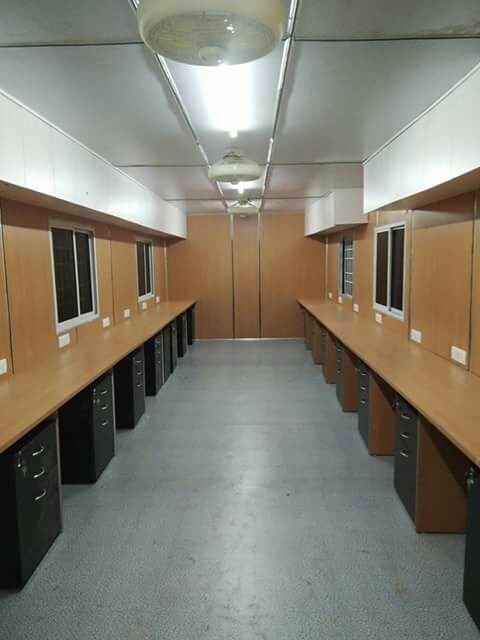 Our prefab structures come with smooth wooden finish walls with allocated space for installing air-conditioners, ventilators, wash basins, kitchenette along with office equipment storage facilities. You can also add a glass front door, premium carpeting, VGC walls, wood sidings and more. Availing a portable office carries a lot of benefit over a traditional building. Not only it offers liberty to discover a varied of locations, but also allow you to customize your office as per your necessity. Our portable offices deliver excellent flexibility for adding and removing spaces inside your Prefabricated Office. Our foldable structures are easily assembled, allowing you to remove a wall for adding more office space, without demolish them. 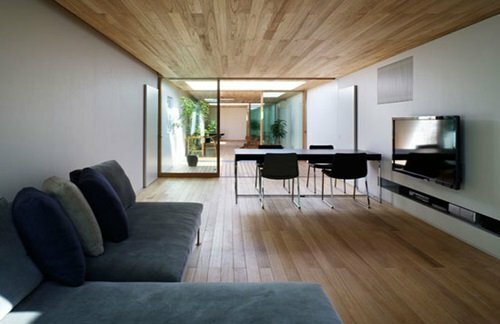 Likewise, if you need additional space just add a wall to build additional space. Traveling different indeed brings a lot of productivity to the business but it also invites some complications as well. However, at SAMAN POS India Pvt Ltd, we have taken care of all those issues beforehand. 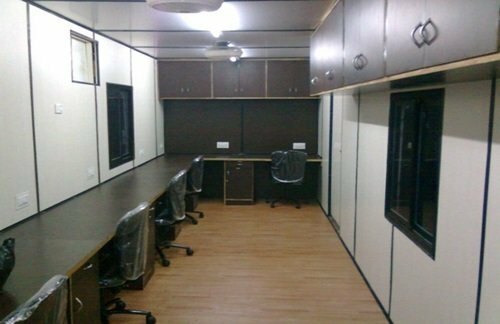 Our Prefabricated Office possesses the ability to withstand the harsh & uncertain climate. Our premium quality ACP materials and robust manufacturing process fortify our products to endure summer, heavy rainfall, hailstorms, cyclones, floods, and earthquakes. Complying with the International Standard of Safety, we deliver you a product that offers protection against electrocution and fire. Every new place draws new customers to your office front door. It’s an occasion which can’t be enjoyed staying within a brick and mortar wall. You may find investing in a movable office as a risky investment but it’s worthy of all your investment. Expanding your business in different part of the city requires a significant amount of money and time which involves buying office space, construction cost, cost of raw materials, along with a myriad of legal procedures. However, with our Prefabricated Office, you don’t have to follow these complex procedures. You can travel any part of the country and offer your services while improving your brand value simultaneously. As our prefab products come manufactured directly from the site, you don’t need to invest in any form of construction process nor have to hire any labors for onsite work. Are you planning to buy Mobile Offices? Do you need a portable office.You can avail amazing offer of Portable offices. Just ring us and get the best quote now because we are leading manufacturer of portable offices.